Pics from our BIG day are on the pictures page! Congratulations to the Fairbanks Marching Band on their second place finish at the Xenia MSBA contest! The group finished second in class AA (out of 6) and second overall (out of 8). Their score of 58.8 (out of 100) was second only to Franklin Heights High School from Columbus! Bravo! Brava! Other bands in competition included West Carollton, Greenview, Mt. Healthy, Tecumseh, Roger Bacon, and Hamilton. I'm proud of each and every band member for giving their best. Our final regular season contests are in two weeks! This is my first-ever official "blog from my phone". I know it's not too exciting, but it might come in handy sometime! Here's the video from Ridgemont. Looked great! New Blogger Beta - Exciting Changes! Blogger just did a major update of services and I switched all my blogs over to the new Blogger Beta, which gives me a lot more blogging power, including categorization of posts by goup! I hope you notice changes soon. This also means, however, that there may be some bugs time to time. If you notice something that looks really WRONG on my page, please let me know so I can work on resolving issues as soon as possible. Thanks! The calendar of events has been updated with lots of info including: Change of homecoming parade to just a bonfire, all pep band games, and the holiday concert! Please remember to bring your uniforms back ASAP. If you need buttons repaired, please get it to Mrs. McKenna after our Saturday performance. Friday, December 1Friday December 15Saturday, December 16 (Alumni & Seniors)Friday, January 5Saturday, January 20 (Girls BB)Tuesday, January 23Friday, February 2Friday, February 6 More details to come, including times, rehearsals, and guidelines. Mark your calendars! Here's the promised podcast. Listen to see what boos/bravos are mentioned and use it to prepare for your performance this weekend. Itinerary for Saturday (Xenia) - FINALLY!!! I just received the itinerary for Saturday. We perform at 1PM. Awards are at 2:55 and we will head home at 3:30PM. ETA is is 5PM with the picnic immediately following. We have a tough class, with six bands including Roger Bacon (Cincinnati), Hamilton, Franklin Heights, Greenview (Jamestown), and our nemesis from last year...West Carollton. Click on the itinerary and schedule of bands below to enlarge. I'll be handing out "Sing, Sing, Sing", the sencond song of our senior show, today during 8th period. A recording of the song (not the band version) is available on the member page. Please listen to it before we sight read tomorrow (Thursday). It's a great choice, seniors, and a great piece! I have posted all of the information for 5th grade band parents and students, including info on supplies, instruments, books, schedule, and contact information. Click HERE for all the important stuff! I finally talked with someone at Xenia and there's all kinds of news. First: The contest has been moved from 10 to noon. Second, the schedule has not been set in stone yet. The Xenia boosters meet tonight to finalize the schedule. We are tentatively scheduled to perform at either 12:30 or 12:45. There is no time set yet for last band or awards. I will let you know as soon as I know. I know some of you have other events scheduled in the afternoon. Those of you who have those "early releases" approved may leave as soon as we are done performing (1:00 at the latest). We'll load at 9:00 A.M. and leave FHS at 9:30. We'll arrive at XHS at 11, and go to warm up at 11:45ish. After that...who knows? I'll keep you posted. Supposedly I will recieve more info via email this afternoon. Still no info from the folks at Xenia. I've left three messages today and have gotten no response. Our estimated departure time is still 8:00 A.M. on Saturday morning. I'll let you know more as soon as I know. JHCB - Be READY for tomorrow! Fairbanksband.org has been updated with info on this Friday's football game, the Oct. 12 homecoming parade, and what little info I have on the Xenia contest this weekend. Click the pic to check it out. Well, it wasn't color, and it wasn't front page, but it was BIG. If you missed the article, or forgot to clip it, you can see it by clicking the small version below. Bravo! UPDATE: Note the edit made below: Make checks payable to "All Through The House" Thanks. Sarah's aunt has been so kind to us the last few years by bolstering our FMB wardrobe with cool couture. This year's offering is a black tie-die tshirt with black and red printing, as well as "FMB" on the sleeve. She's also kind enough to donate all the profits to the music department! If you would like to order one of these amazing t's (this is NOT a required purchase), please write your name, size, and/or desired personaliziation ($.25 per letter if you are interested) on a piece of paper, attach a check for $15 made to "All Through The House", and get both to Sarah C. as soon as possible. Thanks to Sarah for coordinating this sale each year, and to her aunt for making such cool clothes for us bandos! Looks like my wish has come true and most of the moisture of this storm has passed through before game time. You should, however, still come prepared for rain tonight with umbrellas, raincoats, ponchos, plastic...whatever. And do you "no rain" dance. The student council is sponsoring a homecoming parade in Milford Center on Thursday, October 12, and the FMB will be participating. This is a required performance. We will warm at 6:30 at the elementary school and the parade is at 7PM. Dress for the event will be your summer uniform shoes, red band polo shirt, and blue jeans. If the weather is cool, you may wear a jacket, coat, or sweatshirt so long as it is red as well. I would encourage you to "spirit up" your attire as well with temporary tatoos, instrument decorations, FHS buttons, etc. I'll give more specific guidelines in class. If you have a schedule conflict with this date, I must be contacted by a parent at least 14 days in advance, as per the Fairbanks Band Attendance policy. I will be as flexible as I can with pre-existing conflicts, however NO absence is excused without proper notice. TCB. Thanks! Please reserve the weekend of Nov. 2, 4, and 5 for if we qualify for OMEA state finals. We won't know what date/time we get until after October 14. Please let me know ASAP if you have any unavoidable conflicts. I know I worked you all pretty hard last night and had to "get you in the mood" for rehearsal as well, but I wanted to let you all know that we made great strides in our preparations for our next contest on Sept. 30! Thank you for all of you hard work, memorization and maintainence, and continuing to reset and resize. We have the entire haltime at Yellow Springs, so we'll do the entire contest show, including march-on, warm up, and march off. Dress is full uniform. The weather looks kinda iffy, with at 50% chance of rain, so come prepared with rain gear! Also, a picture and article should be in the Marsyville Journal-Tribune either today or tomorrow. Look for it! I just got this from Nathan G., who is now in Alabama. If you need his phone number or email, please let me know. We will be outside no matter what Wednesday. Please come prepared for the cool weather 3:15-5:15. We'll be working music and drill the entire time. If you need individual work on ANY of your music, get it done ASAP. Only three full rehearsals remain until our next contest performance! The recordings I made today of the warm up chorale and the contest show are available on the members only page in mp3 format. I think you'll notice the difference between winds and percusison balance now. There are some intonation problems that are very evident. Listen carefully woodwinds and trumpets! I hope you use these resources to improve your own performance! If you forget your username/password, please email me. PS - There a LOT of music that the FHSCB and JHCB are playing this year on the member page too. Listen and enjoy! I got the recap sheet today for all bands at Hilliard. You also beat Westerville North, Worthington Kilbourne, and Middletown (All AA bands!). Click on the pics to see the full recap sheets. There are still 10 of you who need to get your official FMB tshirts. Please get $12 to Mrs. Garwood ASAP. Make checks payable to "Fairbanks Music Boosters." We'll wear these under our uniforms for the rest of the season. There are also plenty of shirts available for purchase by family, friends, and neighbors. Same price. Contact Mrs. Garwood if you are interested.After consulting with the band seniors, we'll be doing another OMEA contest in Hamilton on October 14 instead of a Mid-states at Westland. This gives us another opportunity to qualify for state contest, which is in our power this year. Speaking of...OMEA state contest is on Saturday, November 4 in Columbus. Please reserve this date in case we do qualify. So many parents that they are too numerous to list here.Word travels fast....but don't let it go to your head! We were victorious on one day, against one set of opponents, under one given set of conditions. That could all change on Sept. 30! In the meantime....enjoy all the accolades that come your way :-) You DESERVE it! Balance and blend between winds and percussionPercussion clarity and techniquePercussion dynamics...i.e. playing someGuard will be learning new routine and working on completing the show. If it is clear, we will do all of this work outdoors. If it is raining, we'll be inside. Here's the score recaps for B and C at the Hilliard contest. Higher scores are good (0-300). Lower Ratings are good (V is lowest, I is highest). Click on the graphic above to enlarge. Originally uploaded by fhsbando. Congratulations to the Fairbanks Marching Band for their first place finish in class "B" at the 31st annual Hilliard Marching Band Contest! The group performed well and outscored three other bands in their class to capture their first top prize since 1996. Pictures are available on the Picture Page. Video will be up a soon as possible. Members: rest this Sunday and be ready for rehearsal on Monday! Two weeks until our next contest! Originally uploaded by fhsbando. Pictures from the game at Lima Perry are on the Picture Page. I had my good camera so there are quite a few closeups this week. If you haven't used the search feature, you can look for pics by keywords. Try typing in your first name and see what you get! Video from the Lima Perry performance in our contest hoodies has been posted. Click on what best fits your computer/connection. Someone's Cell Phone Is Driving Me Crazy! If you are the band member who carelessly left your phone somewhere in my instrument room, left it on, and have a dying battery that beeps every five minutes, please get it and turn it off before I go insane. Thank you. This is also a friendly reminder to all band students that cell phones should not only be put away during school hours, but also TURNED OFF! Tshirts will be in the building very shortly! (yay!) I will let you know the arrangements as soon as I talk to Mrs. Garwood. If you want to pre-pay, put a check for $12 payable to the Fairbanks Music Boosters in the mailbox in the band room. Be sure to put your name in the "memo" area of the check. Mr. Craycraft, superintendent of Fairbanks Schools, was kind enough to send me a letter addressed to all of us and I thought I would post it to share with you. It appears you've made a good impression so far this year! Click the letter to enlarge. Looks like it's going to be perfect this weekend! FMB - IMPORTANT CHANGE OF VENUE!!! I just received a call from the Hilliard Band contest chairperson. Hilliard Darby's field is a MUD HOLE. They have therefore moved the contest to the Hilliard Davidson field, which not only drains better, but is also not being used for a game Friday night. You can get directions by clicking on the map below. Everything else remains the same, just a different place. Just a reminder FMB - we march rain or shine tomorrow. Please come prepared. We MUST learn how to get on and off the field at the very least. Bring boots, ponchos, raincoats, plastic bags, umbrellas.....whatever. You might want to at least consider a pair of "mud shoes." See you there! Rumors are that the new iPod nanos will be released today, as well as a possiblity of a true "video" iPod. It's also a lock that the iTunes Movie Store will be open tonight, as well. Check HERE after 1PM to find out. WAY out there is a theory that the long-anticpatied "iPod phone" will be introduced. Hmmm...we'll see. I'm not holding my breath. I have two priority seating tickets for the Air Force Band's concert at Marysville High School on Wednesday at 7:30. The concert is free and open to the public, but those with courtesy tickets are seated first, then the remaining seats are general admission. Once all seats are full, they close out the rest of the patrons. I'll gladly give my two passes to the first band/choir member who requests them by posting a comment to this blog post (click "comments" below). I encourage EVERYONE to go to the concert, however. The Air Force band is a top-notch wind ensemble! UPDATE! : Congrats to faithful blog reader Victor for being the first to respond! The tickets are now taken. Thanks for all who expressed interest. I hope you'll still try to get in the door tomorrow night! Click on the itineraries to enlarge. FMB members - picture day is Wednesday. You'll need your full uniform. HS students will have their individual pictures taken during their study halls. If you do not have a study hall, you must get yours taken during late arrival or during lunch. Tolles students will have their individual picture taken after the group photo. JH members of the FMB will get your picture taken during 2nd period band. All band members will need to be present for the group photo during last period. 7/8 members are excused from class (but still responsible for missed work) during their 9th period. Everyone should be out of uniform by 3:00 so we can start rehearsal on time at 3:15. Bravo, FMB, on a great rehearsal. We made great progress in cleaning drill and it gets more confident every day. We've had problems at contest in past years because we've had to "think" about what we have to do. I have the confidence in you that you can perform from HABIT this Saturday. When you do this, nerves are not an issue. A great show doesn't come from that extra boost of adrenaline, or from the scrutiny of the judges. A great show happens at contest because that's how we've rehearsed it! If Wednesday goes as well as tonight did, there's no stopping you at Hilliard! Another band has been added to our class: Alexander High School from southeastern Ohio. Our performance time is now 6PM and we perform fourth out of four in our class and fifth overall. Awards are now at 10:15 and return to FHS is 11:15. Just a reminder that if you plan on not taking the bus home, you must get a note to Rob before we leave at 3 PM. Don't Forget the Good Music Adventure! Originally uploaded by fhsbando. Pictures from Friday are up on the Picture Page. Enjoy! Here's video from Friday night's game. Download a size that works for you, your computer, and your connection. The full resolution iPod video version required iTunes to play on your computer. The others are in Quicktime, which your browser should recognize, but if not, you can get Quicktime HERE. You all performed three great shows last night. Enjoy your weekend off! Rehearsal Monday and Wednesday this week...3:15-5:15. Here's the list of who is performing and when. A detailed itinerary will be available next week. Please note I have provided likes to the bands in our class. Emma M. and Hannah D. Please pay the Boosters for your shoes before the game tonight. Thanks. There will be no supervision for students after school on Fridays of home games. If you choose to stay, you do so at your own risk, as neither the boosters or I will be there to supervise this Friday or any Friday where there is a home game. If at all possible you should go home, relax a bit, get some food, then get back to the school for rehearsal at 5:30. See you then! It's official. North Union could only get four bands (including us and them) for their festival on the 30th. The event is therefore cancelled. This is no big blow to our calendar. I had only planned on doing one event that day until the NU event came up and decided to do a double that day. We're still doing four contests on three weekends...more than enough events in my opinion. Enjoy your night off. We DO still have the Xenia contest at 10 AM that day. We should be back by 5 PM or so from that. Progress Book Woes. Sorry, Choir!!! Thanks to those of you who noticed the problem with choir grades in Progress Book and brought it to my attention. For some reason, the assignment auto entered "100 points possible" instead of "10 points possible". Neeless to say, 10 out of 100 pretty much wrecked everyone's grade! The problem has been fixed, so check your grade again to make sure they changes have taken place. If there are any residual problems, please email me ASAP! My apologies and thanks for bringing the problem to my attention! I just wanted to tell all FMB members that I was very pleased with the progress you made during Tuesday's rehearsal. I'm excited for this Friday night. It should be a big crowd and I can't wait for you to get a chance to show off the finale to the home crowd. Let's have another good work session today today. See you at 3:15! I saw this video by the band OK GO for the first time this AM. I hope you all can appreciate how much practice and coordination it takes to do something like this in one take. Oh yeah...the music is pretty good too. Here's the schedule for Friday...same as last week except we will be in full uniform! Click on the picture above to see an enlarged version. If you are not one of these people, your absence will be considered unexcused. Those who DID give me notes by now, but did not get them to me by the deadline will be given an opportunity to earn the five points back. All others are out of luck. I know this is an odd week because of labor day, but the Tuesday rehearsal has been on the calendar since July, and I reminded you in person last Monday about it, and also reminded you here on the blog. Please be there, or be excused. Thanks. 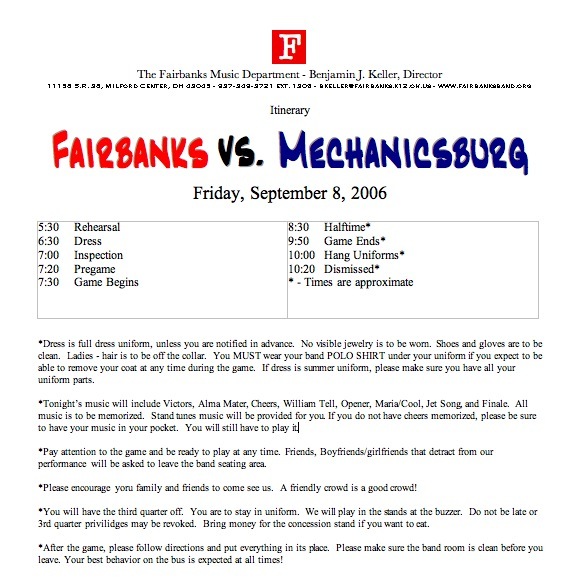 Fairbanksband.org has been updated with this week's FMB info, pictures from Friday's home game, and the video from our most recent performance. "Class is an aura of confidence that is being sure without being cocky. Class has nothing to do with money. Class never runs scared. It is self-discipline and self-knowledge. It's the sure footedness that comes with having proved you can meet life." Originally uploaded by fhsbando. Pictures from Friday night's home game vs. Southeastern are on the Picture Page. Thanks to everyone who made Friday night a logistical success: Robbie and Helene, The Longs, Mrs. McKenna, Jessica, Jessica, Sarah, Mrs. Rigsby, Mrs. Garwood, Mr. McKean....and EVERYONE that did a little bit so no one had to do a lot. Members: Thanks for putting pregame behind you so we could have a successful halftime. Let's make sure next week's pregame is a success! See you on Tuesday! Three different sizes of Friday night's home performance are linked here, 8.6Mb, 11.3Mb, and 47.2Mb (iPod ready) Click whichever size works best on your system. The BIG file is formatted for your video iPod and will open in iTunes.